Ruthless Golf: Guess Who's Back on the Leaderboard? The wind died down for the third round, although it changed direction for the third day as well. (Unless something changes, today's round will see wind from yet a fourth direction -- something unusual at Doral before the removal of so many trees.) The field's scoring average dropped nearly 3.5 strokes from Friday's 76. A lot of balls still went in the water, but it was generally due to poor shots -- players were starting to play Doral more like a links course and seeing some success. Tiger's charge up the leaderboard early in the round got the media in a festive mood. 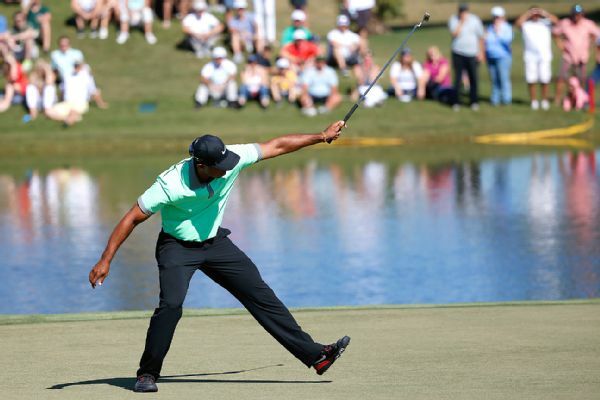 CBSsports.com eagerly announced Tiger Woods Shoots Scorching 66, Will Compete for Doral Title Sunday while SportingNews.com proudly proclaimed PGA Tour: Tiger Woods Tames Blue Monster with 66 at Doral. ESPN.go.com (the source of the photo above) went all Jason Dufner on us and enthusiastically offered an understated Tiger Woods back in it after 66. But all jokes aside, it was certainly newsworthy. Tiger's 66 -- 8 birdies and 2 bogeys -- was the best of only 9 sub-70 rounds on a day where Doral was there for the taking. He leapt over 21 players to grab a T4. But he also seemed to pick up right where he left off last Saturday at Honda before back problems derailed him on Sunday. To be only 3 out of the lead (-1) is no small deal after the start of Tiger's year so far. On top of the heap (-4) is one of the guys from my Final Four at the Accenture, Patrick Reed. (Clearly I was a WGC early. My bad.) How Patrick will fare with the Big Cat playing in the pairing ahead of him remains to be seen, but I suspect his experience at Humana (where he barely hung on to win after shooting three 63s) will help him here. Patrick is currently the youngest player with 2 PGA Tour wins; he has a serious chance to make it 3 today. Likewise, you've got to like Dufner's chances. He's done the major win thing before; unlike Reed, he's used to playing against a stiff field like this. He's only two off the lead at -2. Hunter Mahan also sits at -2 and has won WGCs before. But I have to admit I have my doubts about his ability to finish this one off. It's not his mental toughness; he just seems to be a bit wilder than normal with his drives and approaches this week. And rounding out the under-pars is Jamie Donaldson, the unnoticed member of today's Fab Five. Donaldson, from Wales, has 2 wins on the European Tour, is #6 in the Race to Dubai and #30 in the OWGR. He managed to post 70 in that nasty weather on Friday, the best of the day, so don't sleep on his chances. Of course, these aren't the only guys with a chance to avoid getting fired at Trump's Playground today. But they're certainly the most likely... and you've got to think that seeing Mr. Sunday Red in the penultimate group is going to make it a lot more exciting than it's been in a while.